Christmas is just around the corner. Many people are thinking about what they’re going to purchase for this holiday season. So much has been written about conservation in gift giving: homemade presents, recycled gift wrap, etc. With that same spirit in mind, consider a few simple steps that you can take to protect the environment when buying and decorating your Christmas tree. Have you tried keeping a live tree in a pot? If properly cared for, these can last for years, thriving outdoors when they’re not sprucing up your home. (Yes, pun intended.) 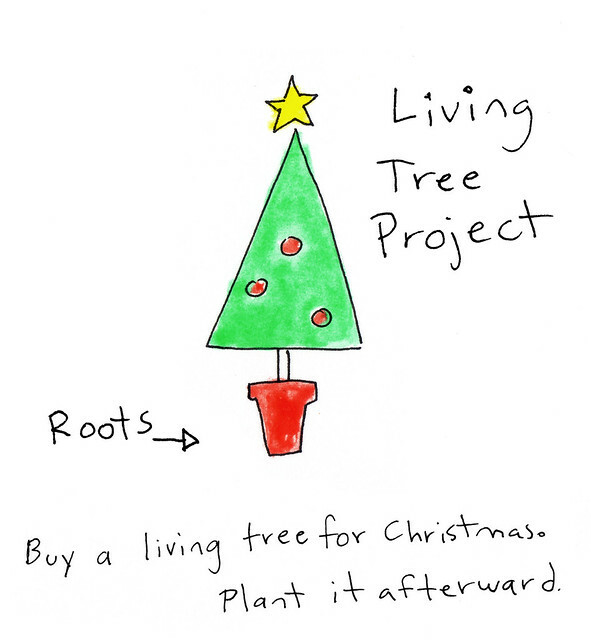 Alternately, a live tree can be used once and then planted! Do a little research to find Christmas trees that are sustainably grown and harvested. Check out the National Association of Conservation Districts for information about your state. According to the National Christmas Tree Association (did you know there was one? I didn’t), Christmas trees are biodegradable. Contact your local Department of Public Works to find out how you can turn your tree into mulch. It’s the gift that keeps on giving. . . to your garden! When decorating your Christmas tree, put the lights on a timer so you won’t forget to turn them off. Better yet, conserve energy by not using lights at all! Challenge yourself and your family to come up with homemade decorations from things found in nature, like pinecones, berries, and pine branches. Or recycle household items: egg cartons, bottle caps, scraps of fabric, and so on. An interloper! Photo by ~*Leah*~ on Flickr. Christmas is about giving. That includes giving back to Mother Earth! Make this holiday season special by finding ways to protect the environment. Continue reading our blog to learn how you can help protect the environment 365 days a year!